Last year my daughter was very into ballerina’s. Angelina ballerina to be specific. 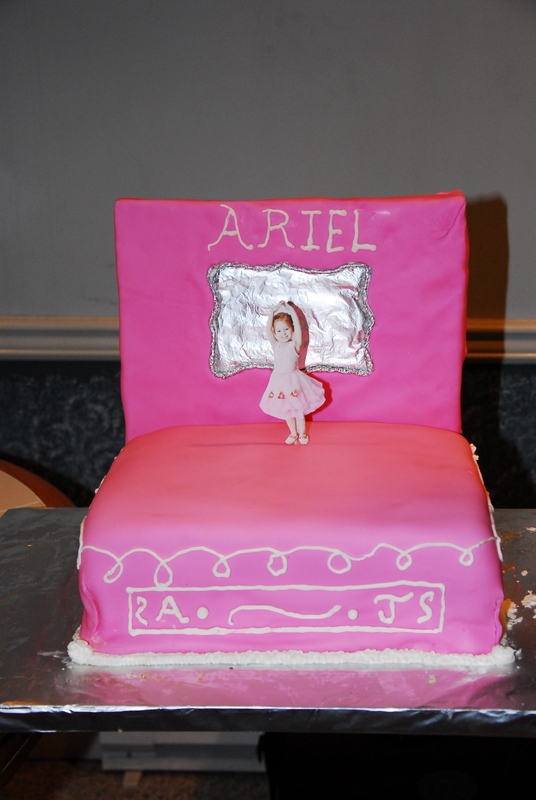 So we surprised her with this music box cake with a photo of herself in a tutu as the doll dancer. Again we made the fondant ourselves: http://whatscookingamerica.net/PegW/Fondant.htm It’s tasty and pretty easy to make. It was two regular cake box cakes with icing in between and then covered in icing, with the fondant on top. We also put fondant on a piece of cardboard and my husband put skewers through the cardboard and into the cake to hold it on. We used tin foil for the mirror and icing to attach it. My husband then piped icing on here and there to give the final touches. We printed the photo of her in her tutu and attached it to a thick metal wire and stuck it in the cake. She enjoyed ‘twirling’ her ballerina.